So the big trip from Mumbai to Kolkata and back never happened. A couple of launches and shoots took away all the days I had and that meant somequiet time for the Ducati. But there was some action. First I received a most carefully written note from Ducati Italy confirming that my bike was part of the Brembo global brake recall. I was told to "ride the bike carefully" to the dealer. I did and the Ducati Mumbai Service finished before the scheduled appointment. A plastic piston from the master cylinder for the front brake was replaced with an aluminium equivalent. Then I received calls from the insurance guys and then from the Mumbai and Pune dealers. One year for the Ducati then! The latter calls were for annual service with a needless 'threat' that if I didn't my warranty would be void. Turns out, Ducati is now implementing a connected dealer management system in India which gives everyone online access to complete vehicle histories. So while Ducati Delhi did complete my annual service (in terms of the checks and consumables check lists), the poor chaps in Mumbai and Pune didn't know until they actually spoke to the Delhi service team over the phone. Upshot? Sorted! I got Zubinn Design to change my chain and rear sprocket for roughly 10 per cent lower final drive gearing. The result, immediately, was a smoother feeling machine because it runs in a sweeter part of the rev range more of the time. It also changed the available torque at any time and now Feroci feels as alert and bombastic as a 160PS machine really should. To verify this, I took it for a 200km ride towards Nashik, running 140km on the highway and then 70km in the narrow mountain roads that dot the area. What an absolute pleasure! 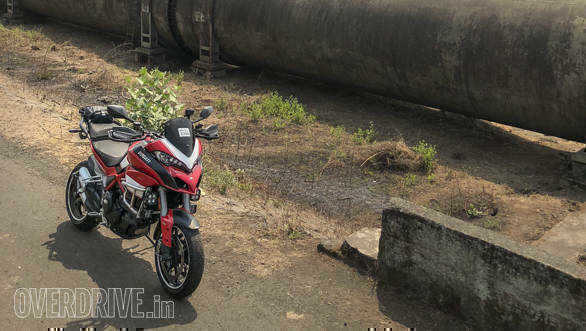 The Ducati trundled sweetly in high gears and low speeds when I was taking in the scenery and it would surge swiftly past traffic when I opened the throttle even the slightest. A combination of excellent tarmac and broken roads were dispatched with such efficiency that I returned home a very, very happy man indeed! Lots of mods as the Ducati prepared for a 4,400km run for a family wedding thing. A trip that didn't take off.